More than six years ago, when Rob and I had been in our house only a few months, a sketchy transient dude walked up our long driveway and knocked on our front door. I can’t remember what he wanted, or what Rob said, but I do remember thinking that when we got a dog, we should get a big dog. Generally speaking, I feel very safe living with Rob. He’s never actually beaten anyone to a bloody pulp (to my knowledge), but I’m confident in his ability to defend himself (and me) from evildoers. The funny thing about getting Isis as our first guard dog is that both Rob and I would have taken a bullet rather than see her harmed. Same with Leo and Mia. Anyway, a guard dog’s bark should be protection enough. No one’s going to break into our house when we’ve got Leo’s big boy bark rumbling from behind the door. No one sober, that is. The guy was persistent in his pounding. He really thought this was the place he wanted to get into. I looked through the peephole and saw a thin white dude wearing a bright blue baseball cap, saying, “C’mon, man!” He was swaying and his eyes unfocused. Definitely drunk. To be honest, I’m disappointed in the dogs’ level of concern. They barked like crazy, yes, but in the same tone of voice they use on the postman, or anyone who comes to the door, whether a salesman or invited guest. I expected them to sound scarier when they sensed how agitated Rob and I were about the guy on the porch. Though it seems there’s no level of barking that would have deterred this individual. He leaned back against the wall behind him, fumbled for a long time with his keys and his phone. Dialed a number and then staggered down the driveway as the squad car arrived. Rob spoke to one police officer while another questioned the suspect. Pretty sure he was just a confused partygoer, but I’m glad we didn’t have to find out what he would have done if the front door hadn’t been locked. Leo keeps watch while Mia “woofs” for effect. A few months before we got Morgan, someone from my husband’s job (he’s in a law enforcement field) made some ugly threats against us. My husband called me at work, which was unusual, and told me that if I called him or dispatch and said a certain phrase that the police would be at the house in a matter of minutes. It was pretty disconcerting. Now, if someone made that threat, I wouldn’t worry much. Kuster would wag someone to death, but Morgan is darned serious about my safety. I think she’d hide if someone came while we were gone, but it would be very different if I were here. She doesn’t mind me all the time, but she does seem to think I’m the one who needs protecting. lol I just hope that we never have to test the theory! 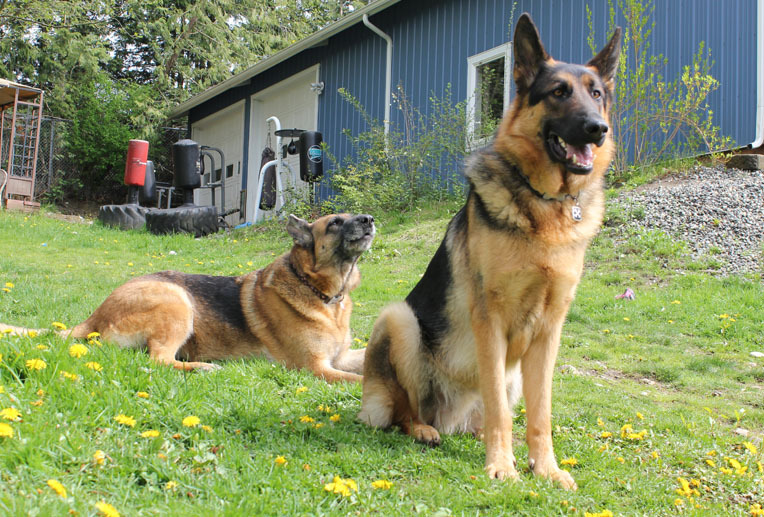 In general, I think even the most friendly German shepherds would deter people from messing with the owners or their homes. Morgan reminds me a lot of Isis. I think you’re right! Kuster loves everyone, and assumes they love him, too, but he scares the tar out of them! Morgan is more than a handful lately! Sorry for your awful experience! Here, I spend so much time trying to get my dog not to bark when someone is at the door! Back in the ’50s my grandfather worked away. One mornning my grandmother got up and there was a hobo sleeping in the kitchen! The dog never made a peep! My biggest complaint about their indoor barking is when a doorbell rings on a television show. I think TV producers do it on purpose to mess with dog owners. This is why my parents need a German Shepherd. Drunk people have shown up at my parents’ door looking for so-and-so’s party and my mother is so good-hearted that she’ll open the door to them. Gah! When I lived alone (and dogless), I had people come to my door all the time in the middle of the night. The previous tenant must have been a drug dealer. I don’t remember those visitors being as scary as the guy last Friday. Maybe because he didn’t go away. Jeri Martin (82 years old Jan. 3 ) worked at many jobs from age 13 to 80. They are so used to being taken care of they forget to take care of you. That’s actually what we’re aiming for. Keeping our dogs safe so they don’t get themselves into trouble keeping us safe. But would it kill them to intimidate away the drunk guy? Imagine that same scenario except on your side of the door are two ferociously barking (using the term lightly) blonde Shi Tsus’ weighing in at an astounding 16 and 17 pounds…lol. That said I am glad that the situation was benign and that you are all ok.